We are a friendly and highly respected physiotherapy practice, based in Northwich in Cheshire. The practice was established in 1987 by Sheena Storah and was subsequently taken over by Amanda Horsburgh in 2002. 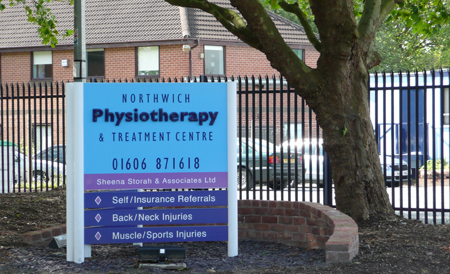 Originally based at Wallerscote House on Winnington Lane in Northwich, we have recently moved around the corner to Northwich Physiotherapy & Treatment Centre on Winnington Avenue. We have plenty of easy parking, comfortable waiting facilities, disabled access and the practice is on the ground floor. We employ the latest practice management systems and can take payment by cash, cheque or credit card.